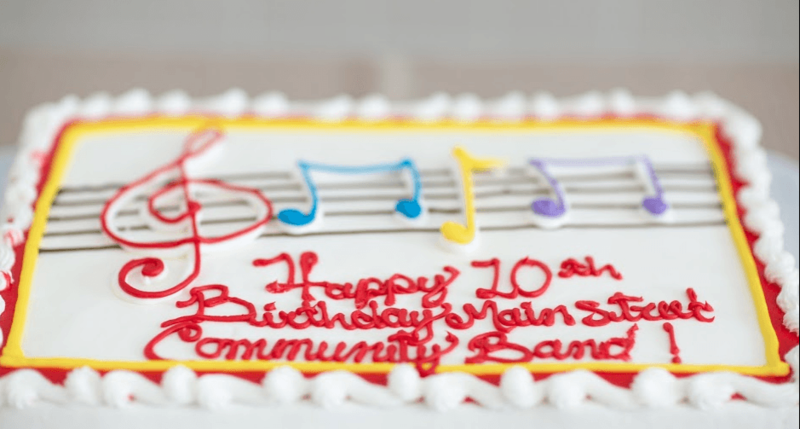 Main Street Community Band Celebrates 10 Years!! Fairfax’s Main Street Community Band celebrated its 10-year anniversary with a birthday concert February 24 to a large and enthusiastic audience at Sidney Lanier Middle School. Fans of all music genres found tunes to appreciate on the program, which included a medley of Beatles hits, a Romantic-era composition by Camille Saint-Saëns, and selections from favorite movie musicals. Following the performance, the audience enjoyed birthday cake to celebrate the band’s decade of success. Among the concert selections was one with special significance to the ensemble: “The Homefront: Musical Memories of World War II.” The piece reflects the commitment band members have to our veterans and to the national Honor Flight Network, a non-profit that brings veterans from World War II, the Korean Conflict, and the Vietnam War to the nation’s capital to visit their respective memorials. Main Street Community Band players often perform for these service members as they arrive at Dulles and Reagan National airports and had the distinction of playing as the 500th Honor Flight landed during Reagan National Airport’s 10th anniversary of receiving such flights. The Main Street Community Band, which met for the first time on February 9, 2009, is the newest adult ensemble of the City of Fairfax Band Association. Since that first rehearsal, when 33 prospective players turned out to learn about the group, its weekly attendance has doubled to average more than 60 musicians. “The band has grown from a very small group of amateur musicians to a well-rounded ensemble,” said John Flahive, trombone player who was the City of Fairfax Band Association president when the Main Street Community Band started. 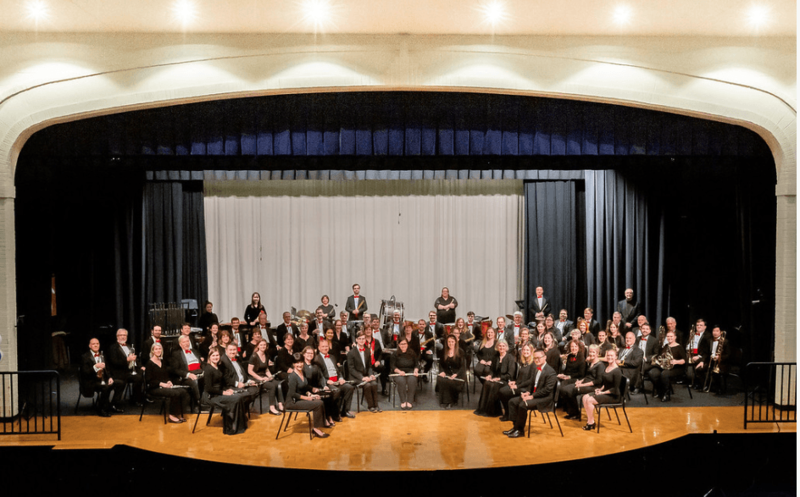 The group attracts audiences of all ages and plays a wide range of music, including old and new band classics, marches by Sousa and King, musicals, and pops selections. The band’s informal, “just-come-and-play” atmosphere is a large part of its appeal. Members represent a variety of backgrounds and ages, including twenty-somethings and grandparents. Many never stopped playing. Others took time off to pursue careers or raise families. But all share a desire to make music, continue or relive band experiences, and meet fellow music lovers, often heading out for a late-night meal after rehearsal. “We even have members who started as adults after their children graduated from high school and didn’t take their instruments with them,” said Jeff Seffens, conductor of the Main Street Community Band. Seffens himself is another distinguishing feature of the ensemble. He is the former 28-year band director of Lanier Middle School. Jeff’s students sometimes return to play in the band as adults, recalling that he hasn’t changed all that much from his portrait which still hangs in the Lanier band room. They just think he’s funnier around grown-ups. All sections are now full, except oboe, and the band is taking on increasingly challenging music. 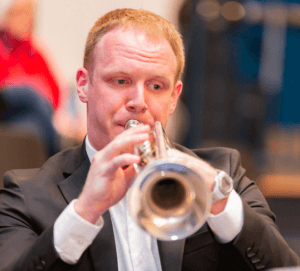 In addition to the main ensemble, membership growth has given rise to two small ensembles: the Main Street Brass Quintet and the Main Street Clarinet Quartet. Seffens said that another of the band’s other memorable activities occurred in 2017 when he and other members of the Main Street Community Band joined City of Fairfax Band members on a D-Day commemoration trip to France, with performances in Normandy, Brittany, and Paris. D-Day was the historic June 6, 1944, invasion of Nazi-occupied France by U.S. and allied military forces. That musical growth has attracted more experienced players, too. One is lifelong Fairfax resident Sharon Triska, a clarinet-playing member since 2011. She was in Virginia’s all-state band as a high school senior and played in Virginia Tech’s Marching Virginians and concert bands throughout college. “It’s fun. We very much have a good time,” she said of the Main Street Community Band. The band will perform next at 4 p.m. on April 28 at the Stacy C. Sherwood Community Center during the Fairfax Spotlight on the Arts. ← Fairfax Saxophone Quartet Performs at Greek Independence Day Festival!